At Civil Eats, nutrition policy reformer Andy Bellatti included a kind word for Food Policy in the United States: An Introduction (Routledge/Earthscan) as part of his year-end review for 2013. Let’s wrap up this look back at 2013 by remembering just a small selection of the many great books that saw the light of day. When it came to an inside look at the world of processed foods, two journalists masterfully pulled back the curtain: Melanie Warner in Pandora’s Lunchbox and Michael Moss in Salt Sugar Fat. Food politics were front and center in Dr. Gyorgy Scrinis’–a lecturer in food and nutrition politics and policy in the Department of Agriculture and Food Systems in the Melbourne School of Land and Environmen–Nutritionism, and literally illustrated in Marion Nestle’s Eat, Drink, Vote. The plight of restaurant workers was well-detailed in Saru Jayamaran’s Behind the Kitchen Door, while New York Times writer Mark Bittman made a solid case for eating a plant-based diet before 6 PM in VB6. 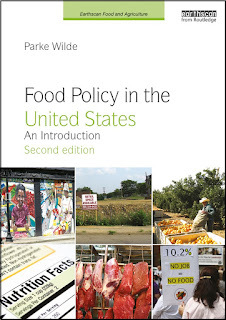 In the textbook realm, Parke Wilde, Associate Professor at Tufts’ Friedman School of Nutrition Science and Policy, released Food Policy in the United States: An Introduction to much acclaim from his peers. Okay, 2014, now it’s your turn. Impress us and give the “good food” movement something to cheer about, please! The Congressional Cranberry Caucus -- yes, such a thing exists -- asked the Department of Agriculture to add cranberries to what’s called the “USDA Foods Available List.” These are “foods that are available for schools to purchase as part of their commodity feeding programs,” says Scott Soares, the head of the Cranberry Marketing Committee. These are the kinds of fruits and vegetables the federal government buys for school meals programs. “When the National School Lunch Program started in 1946, it was very explicitly half about helping children and half about commodity disposal,” says Parke Wilde, who teaches nutrition at Tufts. These days, Wilde says, that balance has shifted; now it is more about nutrition goals. 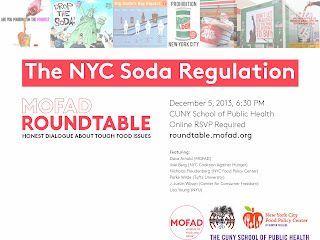 Heritage Radio Network has posted in full a debate Thursday night about the NYC soda policy proposals. I spoke gently in favor of New York City's effort to experiment with moderate policies to change the environment in which sugar sweetened beverages are marketed and sold. I suggested that the Board of Health's proposed limit on sweetened beverage container sizes was not as radical as it has been portrayed. My 2-minute opening statement begins at 17:25. Lisa Young, an author and adjunct professor at New York University, spoke strongly in favor of the proposal, using cups of various sizes as props to buttress her points. J. Justin Wilson trashed the proposal on libertarian and free-market grounds. Wilson represents the Center for Consumer Freedom, an industry-funded organization that runs ads calling NYC Mayor Michael Bloomberg a nutrition nanny. Joel Berg directs the New York City Coalition Against Hunger. He appealed strongly for broader policies to address U.S. poverty and expressed his organization's intention to neither endorse nor oppose the beverage size limitation proposal. Then, Berg livened the debate by launching into an enjoyably vivid and highly critical analysis of such paternalistic policies. The event was organized by the Museum of Food and Drink (MOFAD) and hosted by the New York City Food Policy Center at Hunter College.